Something fishy happens every year in Curt Wissink's Page Elementary classroom and students say it's a lesson they'll never forget. 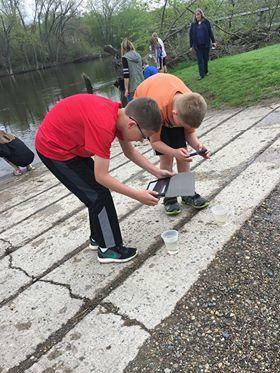 As the salmon Page Elementary fifth-graders raised for months were released into the waters of the Grand River near Lowell, students paid special attention watching the fish swam into the river for the first time and wondering how many would come back to the same river for spawning some day. The Chinook salmon had spent their lives until then in Curt Wissink's Page Elementary classroom. Students had spent months carefully monitoring the eggs, nourishing the tiny salmon and regulating water temperatures. "It's a great science lesson," said Wissink. 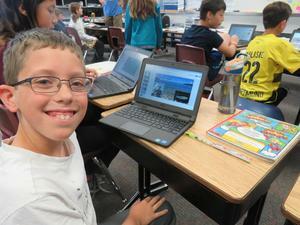 "Students learn about the ecosystem and about invasive species. We talk about the importance of the Great Lakes and fishing and the billion dollar tourism industry to Michigan. I think the kids really enjoy the hands-on learning. It's science in real life right in the classroom." He started doing the project in his classroom about eight years ago. The Department of Natural Resources offers the program and provides grants to schools that sign on to care for fertilized eggs until they can be released as young salmon into rivers and streams. 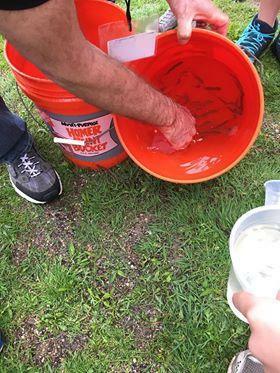 Wissink works with Southwest Trouts Unlimited and the Wolf Lake Hatchery to get the salmon eggs. Allison Fazio excitedly remembered holding the bucket containing some of the salmon on the bus ride to the river. "They kept trying to jump out," she said. "It was really cool." Everett Nichols said he enjoyed the ongoing lesson very much. "We learned a lot about salmon and the Great Lakes. It was a really good experience," he said. This year the class ran into a problem when the water temperature got too hot during Christmas break and all but one of the salmon died. "We named him the Lone Ranger," said Fazio. "He was the only left." The class was able to get more fish to complete the project and the students said they are hopeful many of their young fish will survive. "I wish we had a way to know whether they do make it or not," said Fazio. "But I think they have a good chance." The learning didn't end when the fish left the classroom. After the release in May, students were tasked to create their own "Salmon Alphabet" with a fact and photo or graphic about salmon and the Great Lakes for each letter of the alphabet. "It took a lot of research and there were some very hard letters - especially 'q' and 'x.' Those were the toughest ones," Cole Novak said. Using a little ingenuity he found a way "x" fit perfectly into his presentation. He used "x" in Roman Numerals XLVI to represent the number "46" - referring to the largest Chinook Salmon caught in Michigan - a record 46.06 pounds. The letter "Q" stood for "Quagga Mussels" - an invasive species found in the Great Lakes and something the students learned about as they studied the ecosystem. From "A" for Alevin - a newly hatched salmon" to "Z" for Zebra Mussel " - each student created their own unique alphabet powerpoint project. Novak said it was probably one of the best projects he did all year. "This was especially fun because we got to help raise living creatures and we got to release them into the river where they belong," said Novak. 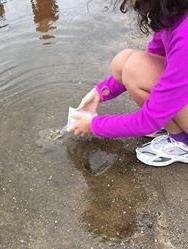 "It was a lot of fun and I really learned a lot about salmon and the fish in the Great Lakes. This is definitely something I've done in school I am always going to remember." Novak said he goes fishing sometimes with his Dad and thinks it might be fun to try salmon fishing on the Great Lake one day. "Maybe I'll even catch one of our salmon," he said.